National Park inspectors saw 71 bears on a narrow stretch of coastal ice in December. Polar bears frequently wander into towns on the northern coast of the Chukchi autonomous region in search of food, the Beringia National Park press service said. "Animal migration along the coastline is clearly oriented towards the southeast. The animals wander into towns on their way. National Park inspectors are monitoring bear migration and are preventing the bears' contact with humans. For instance, a young male bear has been expelled from Neshkan with difficulty, and another three bears have visited the village of Enurmino," the report said. The first ten bears were spotted on Dec. 2, and five days later the predators besieged a family living on Cape Netten, several kilometers away from Enurmino. The inspector who helped drive the animals away said he had seen 24 bears, including she-bears with cubs. The following day National Park inspectors made a trip along the coast between Enurmino and Neshkan. They saw 71 bears on a narrow stretch of coastal ice. 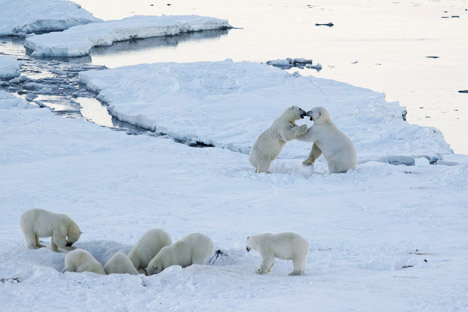 As a rule, polar bears come to the northern coast in late fall or in early winter when the Chukchi Sea freezes, National Park researcher Anatoly Kochnev said. Most animals stay on the edge of the ice, 500-1,000 kilometers from the coast, in summer. But there are few seals and walruses, the main food of bears, in those waters. "After the long hungry summer, bears head for the Chukchi land where dead whales and walruses are washed ashore and where sea-hunting industry waste is accumulated. The bears get this opportunity after 'bridges' form between the frozen slush and the fresh ice. If the sea freezes rapidly, bears do not reach the shore but stop to hunt ringed seals and other seal species on the fresh ice," Kochnev said. It took the ice 'bridge' a long time to form this year and polar bears came to the coast. They continued moving along the thin ice and eventually found abundant food near Cape Netten and Serdtse Kamen. There are about 200 bodies of mammals which died in the fall in the coastal walrus rookery on Cape Serdtse Kamen. "The rookery is very close to the village of Enurmino [12 kilometers]. So, villagers will have to brace themselves and avoid conflicts under the 'bear siege'. Some bears may move eastward, towards the villages of Inchoun and Uelen, unless solid ice begins to form within the next two weeks," Kochnev said. He said those villages should prepare for the possible 'bear siege' in advance.